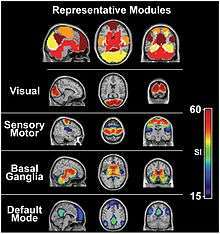 The visual system is the part of the central nervous system which gives organisms the ability to process visual detail, as well as enabling the formation of several non-image photo response functions. It detects and interprets information from visible light to build a representation of the surrounding environment. 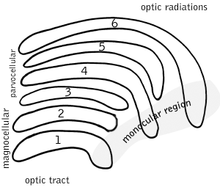 The visual system carries out a number of complex tasks, including the reception of light and the formation of monocular representations; the buildup of a nuclear binocular perception from a pair of two dimensional projections; the identification and categorization of visual objects; assessing distances to and between objects; and guiding body movements in relation to the objects seen. The psychological process of visual information is known as visual perception, a lack of which is called blindness. Non-image forming visual functions, independent of visual perception, include the pupillary light reflex (PLR) and circadian photoentrainment. This article mostly describes the visual system of mammals, humans in particular, although other "higher" animals have similar visual systems (see bird vision, vision in fish, mollusc eye, reptile vision). In the retina, the photo-receptors synapse directly onto bipolar cells, which in turn synapse onto ganglion cells of the outermost layer, which will then conduct action potentials to the brain. A significant amount of visual processing arises from the patterns of communication between neurons in the retina. About 130 million photo-receptors absorb light, yet roughly 1.2 million axons of ganglion cells transmit information from the retina to the brain. The processing in the retina includes the formation of center-surround receptive fields of bipolar and ganglion cells in the retina, as well as convergence and divergence from photoreceptor to bipolar cell. In addition, other neurons in the retina, particularly horizontal and amacrine cells, transmit information laterally (from a neuron in one layer to an adjacent neuron in the same layer), resulting in more complex receptive fields that can be either indifferent to color and sensitive to motion or sensitive to color and indifferent to motion. 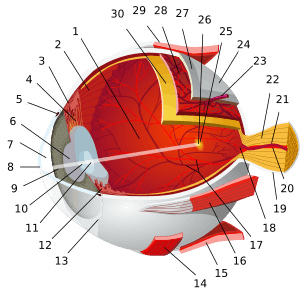 Mechanism of generating visual signals: The retina adapts to change in light through the use of the rods. 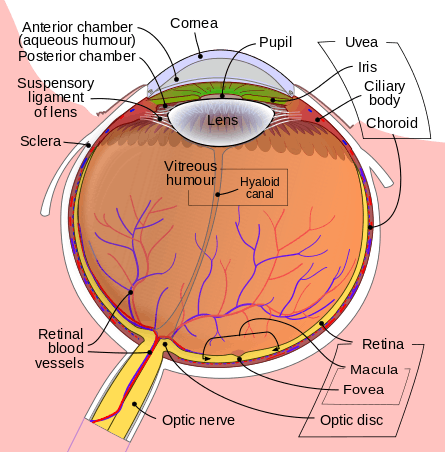 In the dark, the chromophobe retinal has a bent shape called cis-retinal. When light is present, the retinal changes to a straight form called trans-retinal and breaks away from the opsin. This is called bleaching because the purified rhodopsin changes from violet to colorless in the light. At baseline in the dark, the rhodopsin absorbs no light and releases glutamate which inhibits the bipolar cell. This inhibits the release of neurotransmitters from the bipolar cells to the ganglion cell. When there is light present, glutamate secretion ceases thus no longer inhibiting the bipolar cell from releasing neurotransmitters to the ganglion cell and therefore an image can be detected. There is a direct correspondence from an angular position in the field of view of the eye, all the way through the optic tract to a nerve position in V1. At this juncture in V1, the image path ceases to be straightforward; there is more cross-connection within the visual cortex. 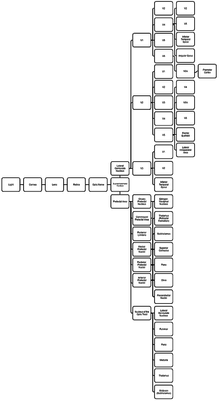 This diagram linearly (unless otherwise mentioned) tracks the projections of all known structures that allow for vision to their relevant endpoints in the human brain. Having troubles viewing? Click to enlarge the image. Together the cornea and lens refract light into a small image and shine it on the retina. The retina transcribes this image into electrical pulses using rods and cones. The optic nerve then carries these pulses through the optic canal. Upon reaching the optic chiasm the nerve fibers decussate (left becomes right). The fibers then branch and terminate in three places. 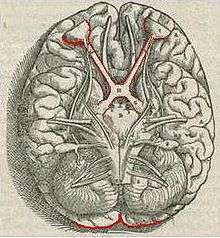 Most end in the lateral geniculate nucleus (LGN). Before the LGN forwards the pulses to V1 of the visual cortex (primary) it gauges the range of objects and tags every major object with a velocity tag. These tags predict object movement. This is clouding of the lens. Although it may be accompanied by yellowing, clouding and yellowing can occur separately. The lens becomes inflexible (known as decrease in accommodation) tending to remain fixed at long-distance focus. This is a kind of blindness that begins at the edge of the field of vision and progresses inward. It may result in tunnel vision. Glaucoma typically involves the outer layers of the optic nerve, sometimes as a result of buildup of fluid and excessive pressure in the eye. Different species are able to see different parts of the light spectrum; for example, bees can see into the ultraviolet, while pit vipers can accurately target prey with their pit organs, which are sensitive to infrared radiation. The eye of a swordfish can generate heat to better cope with detecting their prey at depths of 2000 feet. Certain one-celled micro-organisms, the warnowiid dinoflagellates have eye-like ocelloids, with analogous structures for the lens and retina of the multi-cellular eye. The armored shell of the chiton Acanthopleura granulata is also covered with hundreds of aragonite crystalline eyes, denoted ocelli, which are capable of forming images. The notion that the cerebral cortex is divided into functionally distinct cortices now known to be responsible for capacities such as touch (somatosensory cortex), movement (motor cortex), and vision (visual cortex), was first proposed by Franz Joseph Gall in 1810. Evidence for functionally distinct areas of the brain (and, specifically, of the cerebral cortex) mounted throughout the 19th century with discoveries by Paul Broca of the language center (1861), and Gustav Fritsch and Edouard Hitzig of the motor cortex (1871). Based on selective damage to parts of the brain and the functional effects this would produce (lesion studies), David Ferrier proposed that visual function was localized to the parietal lobe of the brain in 1876. In 1881, Hermann Munk more accurately located vision in the occipital lobe, where the primary visual cortex is now known to be. ↑ Güler, A.D.; et al. (May 2008). "Melanopsin cells are the principal conduits for rod/cone input to non-image forming vision" (Abstract). Nature. 453 (7191): 102–5. doi:10.1038/nature06829. PMC 2871301 . PMID 18432195. ↑ Saladin, Kenneth D. Anatomy & Physiology: The Unity of Form and Function. 5th ed. New York: McGraw-Hill, 2010. 1 2 Zaidi FH, Hull JT, Peirson SN, et al. (December 2007). "Short-wavelength light sensitivity of circadian, pupillary, and visual awareness in humans lacking an outer retina". Curr. Biol. 17 (24): 2122–8. doi:10.1016/j.cub.2007.11.034. PMC 2151130 . PMID 18082405. 1 2 Sundsten, John W.; Nolte, John (2001). The human brain: an introduction to its functional anatomy. St. Louis: Mosby. pp. 410–447. ISBN 0-323-01320-1. OCLC 47892833. ↑ Lucas RJ, Hattar S, Takao M, Berson DM, Foster RG, Yau KW (January 2003). "Diminished pupillary light reflex at high irradiances in melanopsin-knockout mice". Science. 299 (5604): 245–7. doi:10.1126/science.1077293. PMID 12522249. ↑ Turner, Howard R. (1997). "Optics". Science in medieval Islam: an illustrated introduction. Austin: University of Texas Press. p. 197. ISBN 0-292-78149-0. OCLC 440896281. ↑ Jessell, Thomas M.; Kandel, Eric R.; Schwartz, James H. (2000). "27. Central visual pathways". 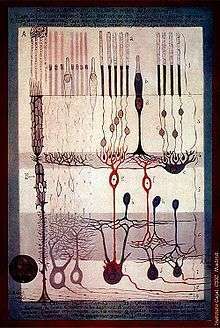 Principles of neural science. New York: McGraw-Hill. pp. 533–540. ISBN 0-8385-7701-6. OCLC 42073108. ↑ Mishkin M, Ungerleider LG (1982). "Contribution of striate inputs to the visuospatial functions of parieto-preoccipital cortex in monkeys". Behav. Brain Res. 6 (1): 57–77. doi:10.1016/0166-4328(82)90081-X. PMID 7126325. ↑ Farivar R. (2009). "Dorsal-ventral integration in object recognition". Brain Res. Rev. 61 (2): 144–53. doi:10.1016/j.brainresrev.2009.05.006. PMID 19481571. ↑ Lane, Kenneth A. (2012). Visual Attention in Children: Theories and Activities. SLACK. p. 7. ISBN 978-1-55642-956-9. Retrieved 4 December 2014. ↑ Adams, Russell J.; Courage, Mary L.; Mercer, Michele E. (1994). "Systematic measurement of human neonatal color vision". Vision Research. 34 (13): 1691–1701. doi:10.1016/0042-6989(94)90127-9. ISSN 0042-6989. ↑ Hansson EE, Beckman A, Håkansson A (December 2010). "Effect of vision, proprioception, and the position of the vestibular organ on postural sway". Acta Otolaryngol. 130 (12): 1358–63. doi:10.3109/00016489.2010.498024. PMID 20632903. ↑ Wade MG, Jones G (June 1997). "The role of vision and spatial orientation in the maintenance of posture". Phys Ther. 77 (6): 619–28. PMID 9184687. ↑ Teasdale N, Stelmach GE, Breunig A (November 1991). "Postural sway characteristics of the elderly under normal and altered visual and support surface conditions". J Gerontol. 46 (6): B238–44. doi:10.1093/geronj/46.6.B238. PMID 1940075. 1 2 Shabana N, Cornilleau-Pérès V, Droulez J, Goh JC, Lee GS, Chew PT (June 2005). "Postural stability in primary open angle glaucoma". Clin. Experiment. Ophthalmol. 33 (3): 264–73. doi:10.1111/j.1442-9071.2005.01003.x. PMID 15932530. 1 2 Schwartz S, Segal O, Barkana Y, Schwesig R, Avni I, Morad Y (March 2005). "The effect of cataract surgery on postural control". Invest. Ophthalmol. Vis. Sci. 46 (3): 920–4. doi:10.1167/iovs.04-0543. PMID 15728548. ↑ Wade LR, Weimar WH, Davis J (December 2004). "Effect of personal protective eyewear on postural stability". Ergonomics. 47 (15): 1614–23. doi:10.1080/00140130410001724246. PMID 15545235. ↑ Barela JA, Sanches M, Lopes AG, Razuk M, Moraes R (2011). "Use of monocular and binocular visual cues for postural control in children". J Vis. 11 (12): 10. doi:10.1167/11.12.10. PMID 22004694. ↑ Pollock. A; Hazelton. C, Henderson. C.A; Angilley. J; Dhillon. B; Langhorne. P; Livingstone. K; Munro. F.A; Orr. H; Rowe. F; Shahani. U, doi:10.1111/j.1747-4949.2010.00516.x "Vision", International Journal of Stroke"
↑ "How the Human Eye Sees." WebMD. Ed. Alan Kozarsky. WebMD, 03 Oct. 2015. Web. 27 Mar. 2016. ↑ Than, Ker. "How the Human Eye Works." LiveScience. TechMedia Network, 10 Feb. 2010. Web. 27 Mar. 2016. 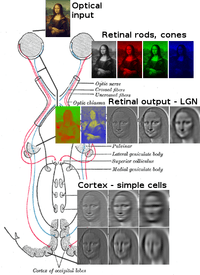 ↑ "How the Human Eye Works | Cornea Layers/Role | Light Rays." NKCF. The Gavin Herbert Eye Institute. Web. 27 Mar. 2016. ↑ "Optic Chiasma." Optic Chiasm Function, Anatomy & Definition. Healthline Medical Team, 09 Mar. 2015. Web. 27 Mar. 2016. ↑ Jefferey, G., and M. M. Neveu. "Chiasm Formation in Man Is Fundamentally Different from That in the Mouse." Nature.com. Nature Publishing Group, 21 Mar. 2007. Web. 27 Mar. 2016. ↑ Card, J. Patrick, and Robert Y. Moore. "Organization of Lateral Geniculate-hypothalamic Connections in the Rat." Wiley Online Library. 01 June. 1989. Web. 27 Mar. 2016. ↑ Murphy, Penelope C., Simon G. Duckett, and Adam M. Sillito. "Feedback Connections to the Lateral Geniculate Nucleus and Cortical Response Properties." Feedback Connections to the Lateral Geniculate Nucleus and Cortical Response Properties. 19 Nov. 1999. Web. 27 Mar. 2016. ↑ Schiller, P. H., and J. G. Malpeli. "Functional Specificity of Lateral Geniculate Nucleus Laminae of the Rhesus Monkey." APS Journals. 1 May 1978. Web. 27 Mar. 2016. ↑ Singer, W., and F. Schmielau. "The Role of Visual Cortex for Binocular Interactions in the Cat Lateral Geniculate Nucleus." The Role of Visual Cortex for Binocular Interactions in the Cat Lateral Geniculate Nucleus. 21 Jan. 1977. Web. 27 Mar. 2016. ↑ Reed, R. Clay, and Jose-Manuel Alonso. "Specificity of Monosynaptic Connections from Thalamus to Visual Cortex." Letters to Nature. Nature Publishing Group, 03 Oct. 1995. Web. 27 Mar. 2016. ↑ Heim, Stefan, Simon B. Eickhoff, et al. 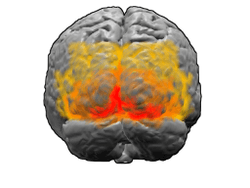 "Effective Connectivity of the Left BA 44, BA 45, and Inferior Temporal Gyrus during Lexical and Phonological Decisions Identified with DCM." Wiley Online Library. 19 Dec. 2007. Web. 27 Mar. 2016. ↑ Catani, Marco, and Derek K. Jones. "Brain." Occipito‐temporal Connections in the Human Brain. 23 June 2003. Web. 27 Mar. 2016. ↑ Benevento, Louis A., and Gregg P. Strandage. "The Organization of Projections of the Retinorecipient and Nonretinorecipient Nuclei of the Pretectal Complex and Layers of the Superior Colliculus to the Lateral Pulvinar and Medial Pulvinar in the Macaque Monkey." Science Direct. 01 Jul. 1983. Web. 27 Mar. 2016. ↑ Hirsch, JA, and CD Gilbert. "The Journal of NeuroscienceSociety for Neuroscience." Synaptic Physiology of Horizontal Connections in the Cat's Visual Cortex. 1 June 1991. Web. 27 Mar. 2016. ↑ Schall, JD, A. Morel, DJ King, and J. Bullier. "The Journal of NeuroscienceSociety for Neuroscience." Topography of Visual Cortex Connections with Frontal Eye Field in Macaque: Convergence and Segregation of Processing Streams. 01 June 1995. Web. 27 Mar. 2016. ↑ Kanaseki, T., and J. M. Sprague. "Anatomical Organization of Pretectal Nuclei and Tectal Laminae in the Cat." Anatomical Organization of Pretectal Nuclei and Tectal Laminae in the Cat. 01 Dec. 1974. Web. 27 Mar. 2016. ↑ Reiner, Anton, and Harvey J. Karten. "Parasympathetic Ocular Control — Functional Subdivisions and Circuitry of the Avian Nucleus of Edinger-Westphal. "Science Direct. 1983. Web. 27 Mar. 2016. ↑ Welsh, David K., and Diomedes E. Logothetis. "Individual Neurons Dissociated from Rat Suprachiasmatic Nucleus Express Independently Phased Circadian Firing Rhythms." Science Direct. Harvard University, Apr. 1995. Web. 27 Mar. 2016. ↑ Harvard Health Publications. The Aging Eye: Preventing and treating eye disease. Harvard Health Publications. p. 20. ISBN 978-1-935555-16-2. Retrieved 15 December 2014. ↑ Bellingham J, Wilkie SE, Morris AG, Bowmaker JK, Hunt DM (February 1997). "Characterisation of the ultraviolet-sensitive opsin gene in the honey bee, Apis mellifera". Eur. J. Biochem. 243 (3): 775–81. doi:10.1111/j.1432-1033.1997.00775.x. PMID 9057845. ↑ Safer AB, Grace MS (September 2004). "Infrared imaging in vipers: differential responses of crotaline and viperine snakes to paired thermal targets". Behav. Brain Res. 154 (1): 55–61. doi:10.1016/j.bbr.2004.01.020. PMID 15302110. 1 2 Gross CG (1994). "How inferior temporal cortex became a visual area". Cereb. Cortex. 4 (5): 455–69. doi:10.1093/cercor/4.5.455. PMID 7833649. 1 2 3 Schiller PH (1986). "The central visual system". Vision Res. 26 (9): 1351–86. doi:10.1016/0042-6989(86)90162-8. ISSN 0042-6989. PMID 3303663. Davison JA, Patel AS, Cunha JP, Schwiegerling J, Muftuoglu O (July 2011). "Recent studies provide an updated clinical perspective on blue light-filtering IOLs". Graefes Arch. Clin. Exp. Ophthalmol. 249 (7): 957–68. doi:10.1007/s00417-011-1697-6. PMC 3124647 . PMID 21584764. Hatori M, Panda S (October 2010). "The emerging roles of melanopsin in behavioral adaptation to light". Trends Mol Med. 16 (10): 435–46. doi:10.1016/j.molmed.2010.07.005. PMC 2952704 . PMID 20810319. Hubel, David H. (1995). Eye, brain, and vision. New York: Scientific American Library. ISBN 0-7167-6009-6. OCLC 32806252. Marr, David; Ullman, Shimon; Poggio, Tomaso (2010). Vision: A Computational Investigation into the Human Representation and Processing of Visual Information. Cambridge, Mass: The MIT Press. ISBN 0-262-51462-1. OCLC 472791457. Schmolesky, Matthew. "The Primary Visual Cortex". Retrieved 2005-01-01 . Tovée, Martin J. (2008). An introduction to the visual system. Cambridge, UK: Cambridge University Press. ISBN 0-521-88319-9. OCLC 185026571. Wiesel, Torsten; Hubel, David H. (1963). "The effects of visual deprivation on the morphology and physiology of cell's lateral geniculate body". Journal of Neurophysiology. 26: 978–993. PMID 14084170 .